The new quick service location at Disney’s Caribbean Beach – Centertown Market – is scheduled to open later this fall and we have some more details about the new location. Centertown Market has been designed as an indoors street market-style area and will feature some incredible Caribbean-inspired artwork when it opens. 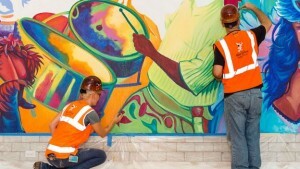 Disney Imagineers have researched many Caribbean festivals and the celebrations are the inspiration for the mural that will be the centerpiece of the new restaurant. Sebastian’s Bistor – the new waterfront table service location – will feature hand-painted fishing floats as its art centerpiece.